Here’s the lowdown on the uber-cool S&S 55th Anniversary show bike built by Francesco Mattioli of Crazyoils, for the S&S display at the 2013 Big Bike Europe show in Essen, Germany. 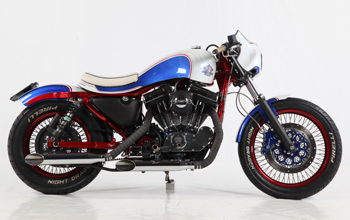 Since the European continental coolness index has its own scale, S&S wanted a special display bike with European attitude for Big Bike Europe. Something a little different from the show bikes we travel with here in the states. To make that happen, S&S contacted Francesco Mattioli of Crazyoils Custom Bike Builders to build a special bike for the show. Francesco’s shop is located in Segrate, Italy, just outside of Milan. Francesco is a member of the International Master Bike Builders Association and is building a reputation in Europe and the United States for his unique, stylish and most importantly, rideable custom bikes. You can check out his work at his website at http://www.crazyoils.net/. S&S asked Francesco to build a custom bike based on a Harley-Davidson® Sportster® motorcycle that would be unique and innovative, but at the same time still retain that Sportster mojo. Francesco started with a stone stock 1991 XLH 883 Deluxe, but since S&S gave him a free hand in the design and construction, all that we really knew about the end product was that it would be really cool and it would be very fast. We knew it would be cool because Francesco was building it, and it’d be fast because of the S&S parts that would be used in the engine. In Francesco’s words “You cannot have a great engine without having a great performing bike to go with it. But at the same time it will still look like a Sportster.” We had no doubt that this would be a stunning bike from the very beginning, and these photos show that our confidence was not misplaced. As amazing as this bike looks, it’s not just a pretty face. This bad boy was meant to move. That’s what bikes are for isn’t it? Since the engine has been upgraded from 883 to 1200cc with the S&S 883-1200 conversion piston and cylinder kit, not to mention S&S 482 cams, Crane Hi-4N ignition, S&S Super E carb, a Stealth air cleaner with Muscle cover and S&S performance mufflers, it should be an exciting ride indeed. Lookin’ good. Soundin’ good. Goin’ fast.